HONOLULU (HawaiiNewsNow) - Most of us spent the holidays carving turkey or ham for special gatherings – how about we carve some duck and celebrate a new restaurant opening in Waikiki by Iron Chef Morimoto! Chef Morimoto is opening not one, but two Waikiki restaurants! 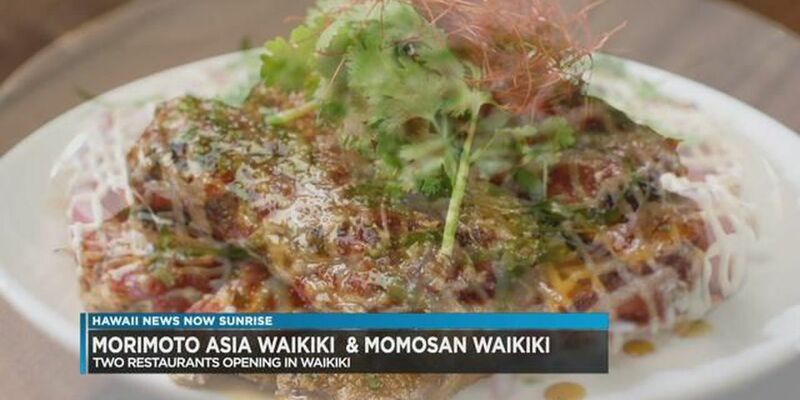 In addition to Morimoto Asia Waikiki, guests can enjoy Momosan Waikiki at the Alohilani Resort. Morimoto Asia Waikiki will serve as the signature restaurant of Alohilani Resort Waikiki Beach that features Chef Masaharu Morimoto's world-renowned cuisine that seamlessly integrates Western and traditional Asian ingredients with unmatched creativity and innovation. The new restaurant will bring an interactive culinary experience to Waikiki Beach courtesy of a glass-encased exhibition kitchen that offers a behind-the-scenes glimpse into culinary preparations and traditions including Peking duck carving, sticky ribs, Morimoto style lo mein and Korean kalbi, dim sum, and traditional wok fry dishes including kung pao chicken and Thai lobster chow fun. The indoor-outdoor dining space will offer a dynamic bar and adjacent outdoor lanais with views out to world-famous Waikiki Beach and its incredible ocean sunsets. For a fun and casual dining experience at street level at Alohilani Resort Waikiki Beach with indoor and outdoor dining options, Momosan Waikiki from Chef Masaharu Morimoto will put noodles front and center and also feature signature Morimoto sake and beer selections. The menu will feature playful small plates and appetizers including pork gyoza, crispy mimiga (Japanese fried pig ears), buta kimchi and Chef Morimoto's unique take on garlic shrimp; innovative salads and classic izakaya style rice dishes; yakitori including salmon and duck; and flavor-forward ramen dishes ranging from a signature tonkotsu to Tokyo chicken. Guests will also have the option to order food to-go and enjoy on the beach.